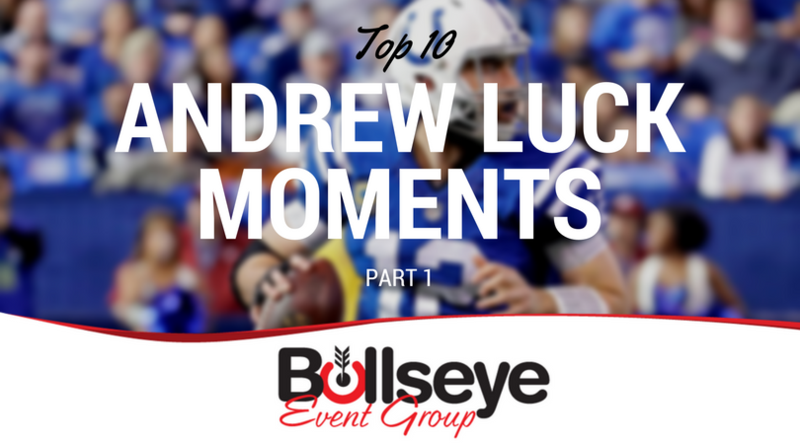 Despite a couple of disappointing seasons, one of the lone bright spots through the rebuilding years for the Indianapolis Colts has been quarterback Andrew Luck. We’re taking a look back at the QB’s first five season and his Top 10 moments with the team. Luck didn’t have a particularly spectacular game when visiting the Denver Broncos in the divisional round of the 2014 NFL Playoffs, throwing for 265 yards, two touchdowns and two interceptions while completing 62.8% of his passes. However, it wasn’t Luck’s statistical game that made the 24-13 victory significant, but the fact that the victory led the Colts to their first AFC Championship game of Luck’s career. And despite a crushing loss to the eventual champion New England Patriots, the postseason run provided hope for the Colts fanbase. In a Week 13 matchup against the Washington Redskins, Luck had one of the best games of his young career. The aerial attack, leading the Colts to a 49-27 blowout of the Redskins, saw Luck complete 70.4% of his passes for 370 yards, five touchdowns and one interception. The win would push the Colts to 8-4, all but securing the team’s AFC South championship late in the year. The 2014 NFL season was the best of Luck’s young career, seeing the QB finish with a 96.5 quarterback rating for the season, throwing for 4,761 yards and 40 touchdowns with just 16 interceptions. Week 3 against the Jacksonville Jaguars was one of the games that helped boost those numbers. Luck would finish the day in Jacksonville with 370 yards, four touchdowns and zero interceptions, a 123.3 quarterback rating. Despite a heartbreaking 39-35 loss to the Detroit Lions, Luck’s return to form for the start of the 2016 NFL season after missing most of the prior season with various injuries was a sight for the sore eyes of Indianapolis Colts fans. Luck finished the game with 385 yards, four touchdowns and zero interceptions, a game that gave fans hope for the future. Despite a losing season, Luck’s Week 1 performance was a testament to the quarterback’s talents when at 100%, something that Colts fans should see promise in. One of the most iconic games of Luck’s rookie season, and no necessarily for the statistical side of things. In just the 7th game of Luck’s career, Luck had garner 297 yards through the air, despite throwing for just one touchdown and one interception. It was the final drive of the game, however, that Colts fans remember so well. Luck led the team on an overtime drive, tied 13-13, down to the Titans’ 16-yard-line. Snapping the ball, Luck threw a dump pass to running back Vick Ballard, who danced his way to the goal line before going full-matrix into the end zone to push the team to a 19-13 victory and 4-3 on the young season. An image Colts fans won’t soon forget. Tickets for the 2017 Indianapolis Colts VIP Tailgates are officially available! With a new general manager and a re-shaped roster, the Colts look to start anew and make a triumphant return to the NFL Playoffs. Get your 2017 Colts VIP Tailgate tickets today!